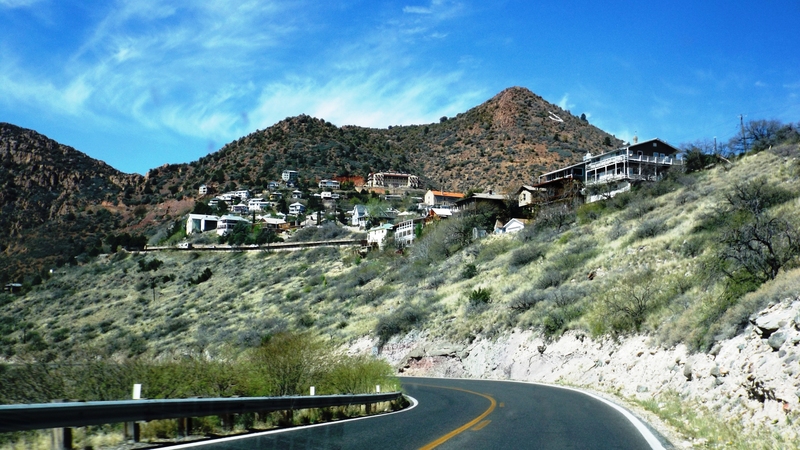 Thursday we made the short, steep drive from Cottonwood to Jerome, that funky little mining town 2,000 feet above us to the west. The drive was almost scary with the steep climbs and descents, narrow roads, and a few hairpin turns. We got there without incident and saw some of the sights. Pink went with us, ruling out food and drink, but it was a worthwhile trip. The city was once home to one of the world’s larger veins of copper, and finding gold or silver along with Cu was fairly common. Its population peaked near 15,000 around 1917, with miners leaving every year after that as the ore became increasingly expensive to mine. 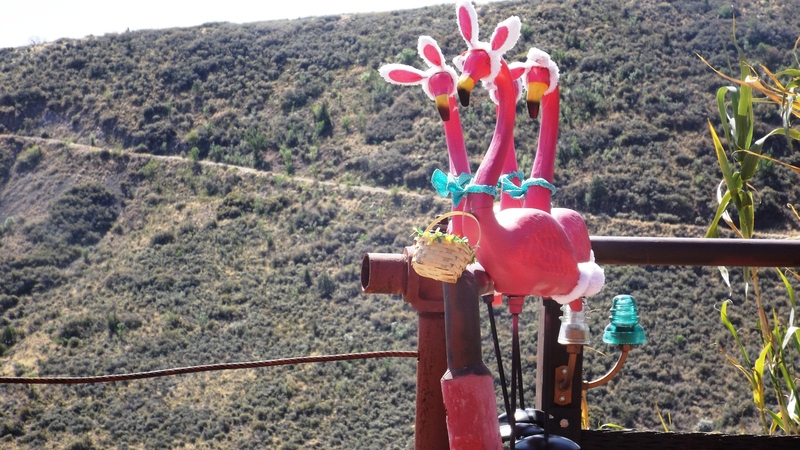 Demand for copper helped Jerome enjoy a brief comeback during World War II, but it’s been downhill ever since. The 2010 census recorded a population of 444. 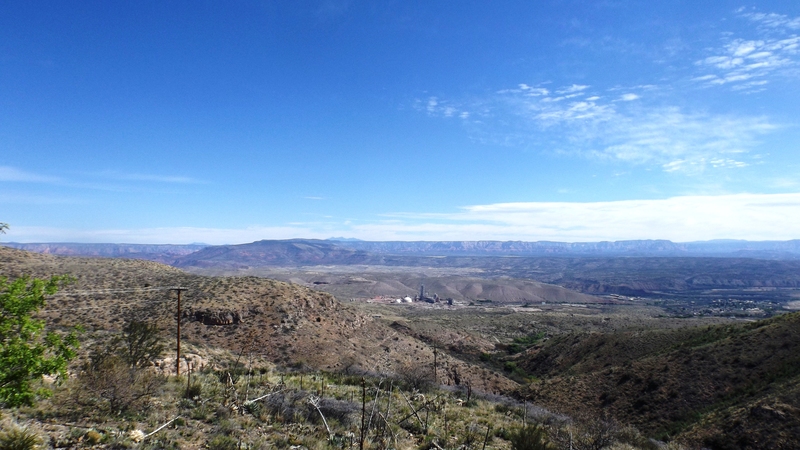 There is a state mining park with an amazing overlook. Jerome still has its old grand hotel, formerly the town’s hospital. It is wonderfully ornate but searingly reviewed on Trip Advisor; in many rooms the heat cannot be adjusted, or turned off. The school has long since closed and was converted to shops and artist’s studios. It is now a town which lives completely off tourism. Its shops sell curios, antiques, art in wildly varying degrees of fineness, and there are many cafes and bars. 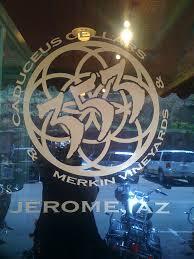 Maynard James Keenan (you metal-heads know him as the lead singer of T00L) lives somewhere around Jerome. He owns a vineyard known as Merkin (you know that word, I’ll let you think … but not too long … yes, a merkin is a pubic wig!) affiliated with a tasting room right downtown. He also owns a shop called Puscifer Store, which offers — at rock concert prices — an assortment of posters (some signed), t-shirts, locally roasted coffee, and a frequently changing assortment of music collectibles. 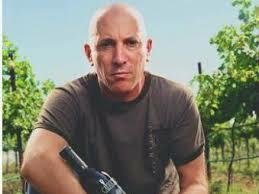 Puscifer is also his current band, of which he is the only regular member. Some say MJK is a difficult personality, but we can’t agree: we did not see him. Copper Plant or Waste Treatment Plant? Jerome is usually five to ten degrees cooler than Cottonwood, courtesy of its 5,000 foot elevation. We hope to enjoy a comfortable late July and early August in Colorado, and elevation will be the key to staying cool. Grand Canyon Village is also a mile or so above sea level, but even now nights can get pipe-bursting cold. After we help the Flagstaff Camping World meet their April refrigerator sales quota (we smelled ammonia, meaning just what it does when a horse can’t get up) we’re off to see The Canyon! We gotta go to Flagstaff for the new refrigerator. I’m not sure where Sedona is in relation to Flag, but if it’s on the way, we’ll be sure to have a taco or enchilada there. Hope you and Linda are well, and making every day count. It appears that is what we all need to do with life, post haste. Dr. Larry, we are in Sedona parked in the best boondocking site in the county. Drove the Red Rock Loop today: fantastic! thanks for the tip; probably would have missed it otherwise. Yes, Dr. Larry, we made it to Sedona. Gotta write something good enough to go with Kat’s pics, and given the raw material she has to work with, that’s gonna be tough. Thank you for suggesting Sedona. 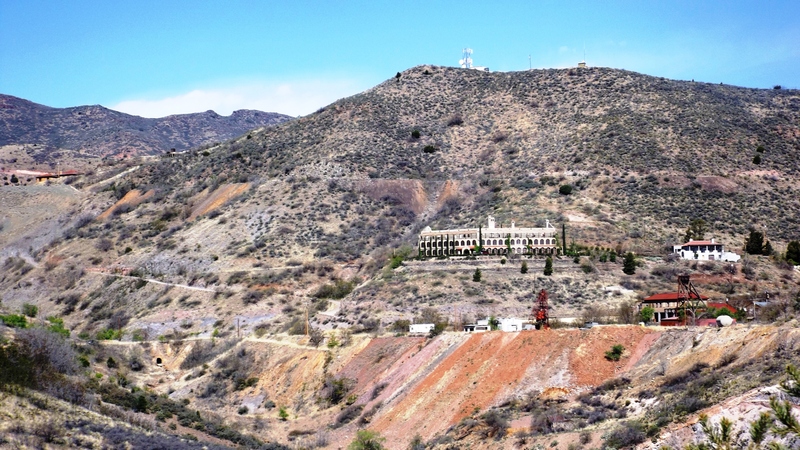 In the photo here, the hotel looks like a skeleton of sorts sitting on that hillside. From viewing it online only, in some regards, the town does look a bit lost in time. Supposedly the Grand Hotel is haunted. Since it was formerly a hospital, odds are good that old-timey malpractice killed more than a few. That would make me want to haint a place. Thanks for the good words, and thank you more for reading us.